Wolverine II (Blue & Yellow Costume), Forge, Iceman, Mr. Sinister, Sabretooth, Wolverine III (X-Men Uniform), Banshee, Gambit, Wolverine IV (Weapon X), Sauron, Magneto. Cable, Warpath, Shatterstar, G.W. Bridge, Kane, Stryfe, Gideon, Deadpool, Forearm. Released by Toy Biz, the first line of X-Men figures is an offshoot of the company's initial release of Marvel Universe figures, and before long, the growing popularity of the X-Men (helped in no small part by the animated series, for which this becomes the de facto toy line of that TV show) leads this series of figures to far eclipse and outlast the initial Marvel Universe line that spawned it. Toy Biz, of course, has a complicated history with Marvel. Following its initial licensing deal with Marvel, the company signed an "exclusive, perpetual, royalty-free license" agreement with Marvel in exchange for a percentage of Toy Biz's overall equity, a move which brought Ike Perlmutter and Avi Arad, co-owners of Toy Biz, into Marvel's overall corporate leadership structure, allowing them to, essentially, win control over Marvel in the wake of the company's bankruptcy in 1996 (thus it could be said that Marvel eventually came to be owned by the toy company to which it once issued licenses to create action figures of its characters, but in the wake of the restructuring, Toy Biz was merged with Marvel in the new Marvel Enterprises company, with Toy Biz as a subsidary). Avi Arad went on to spearhead, as a producer, nearly all of Marvel's live action & animated TV series and films during his tenure with the company (he resigned in 2006; I believe the Ed Norton Hulk film is the last Marvel Studios film to credit him as a producer). Perlmutter, a controversial figure within the industry, remains with the company today, having become CEO of Marvel Entertainment in 2005, though he recently stopped his involvement with the Marvel Studios films, with studio head Kevin Feige now reporting directly to Disney, in part due to Feige's frustrations with some of Perlmutter's less savory actions and beliefs. All of that, because once upon a time, Marvel hired Toy Biz to make action figures for them (and then, you know, went bankrupt). The first series of figures, though all labeled as X-Men, actually feature both Cyclops and Archangel in their X-Factor costumes (Cyclops specifically in his Simonson blue-and-whites), with Apocalypse, at the time considered much more of an X-Factor-specific villain than an overall X-Men one, rounding out the villains alongside Magneto and Juggernaut. Each of the figures in the first series came packaged with their respective trading card from the first series of Marvel Universe cards, though each card had a slightly different background (light blue instead of white) to differentiate it from main set. 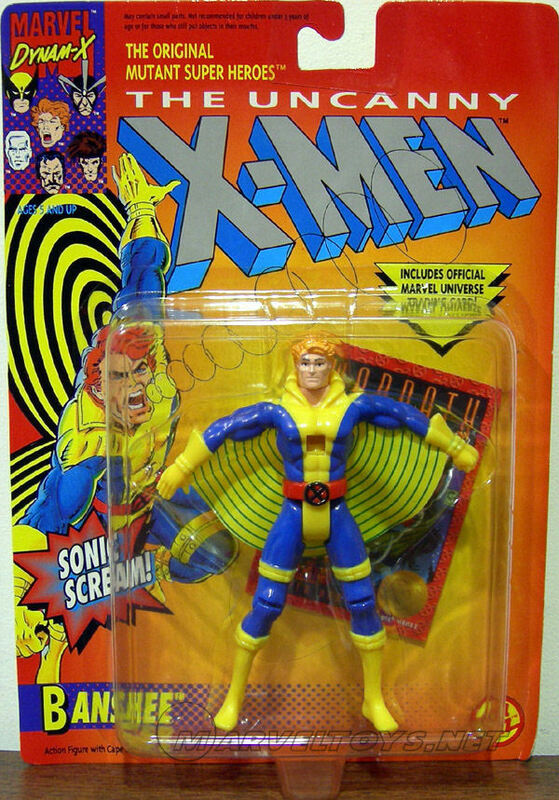 The second series of figures had a card from the Jim Lee X-Men set. The second series of X-Men figures were released in two waves, which sometimes get broken up into Series II and Series III; for the sake of simplicity, I am grouping the various series by year as much as possible (which some reference sites do as well). The second series included an unproduced Havok figure (in his pre-X-Factor black costume), which I believe eventually got released as a Wizard exclusive. 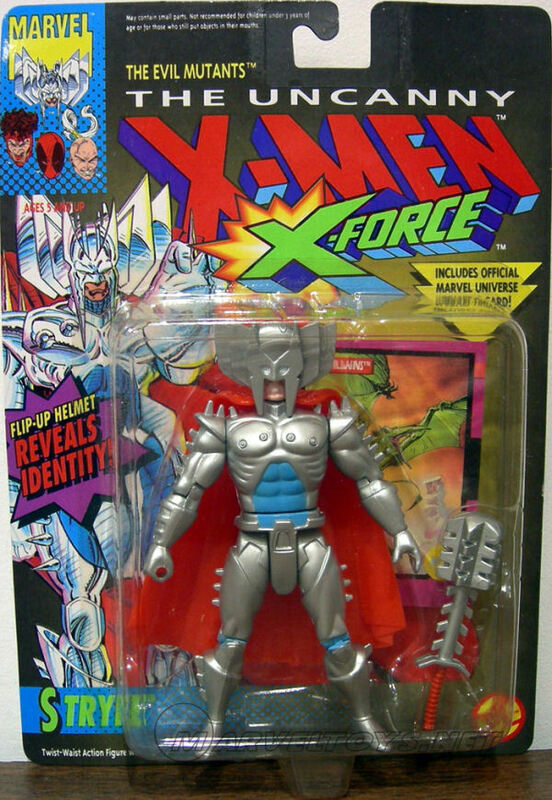 The X-Force figures came packaged similar to the second series of X-Men figures, albeit with "X-Force" emblazoned over the X-Men logo on the card. Cable's figure is based (fairly accurately) on his appearance in X-Force #1 (not surprising, given how many eyeballs saw that issue), and as a result, I think that look is somewhat more iconic than many of his other varied looks. Special thanks to MarvelToys.net for the images. 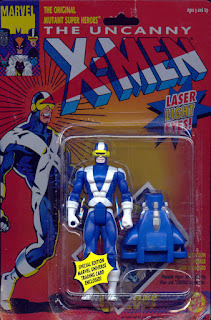 As was common for action figures at the time, many figures, especially from the first wave, came equipped with some kind of action feature: Cyclops & Storm had light up elements (Cyclops' visor and her chest lightning bolt), Magneto's arms and legs were magnetic, Nightcrawler had suction cups on his arms and legs to simulate his wall-crawling ability, etc. Series II continued that trend, with features like Banshee having a whistle molded into his body and Iceman having a section cut into his "ice slide" into which water could be poured and frozen, then slid down the slide, but the second series started the move away from more overt special features in favor of more authentic sculpts and general playability. X-Force being so popular as to warrant it's own line/sub-line of action figures is pretty much the early 90s in a nutshell, but it's also telling that of the nine figures released, only three were actual X-Force members, helping supporting characters (at best, at the time) like Kane and Bridge seem like a bigger deal than they were. Not surprisingly, the first two series of X-Men figures contain several Wolverines, covering both his two mainstay costumes, his short term X-Men uniform (from the brief post-"X-Tinction Agenda", pre-relaunch Jim Lee era of Uncanny) and his look in the then-recent "Weapon X" story (in fact, I encountered that figure and became familiar with that look long before I ever saw any of the actual story on which it's based). Banshee & Forge are curious additions given that the two aren't officially on either X-Men squad at this time (with Banshee already written out of the series and Forge not long behind him), but presumably, they were included simply on the strength of their being some of the few official-looking X-Men in the non-team era when these initial lines were being developed (plus, Banshee made for a pretty nifty action feature). Sauron presumably made the cut based on his return as part of the Brotherhood in X-Force (though he isn't part of that subline) and/or on the strength of being a toy-friendly pterodactyl man. Similarly, Mr. Sinister's inclusion is curious, given that he only recently returned in X-Factor and prior to that was really just the guy who died at the end of "Inferno", but of course, his inclusion here is, intentionally or not, prescient, as he'll soon become a much bigger deal in the X-books (and I wouldn't be at all surprised if his inclusion in this early wave helped in part boost his profile amongst fans). Of the first series, I always liked Cyclops, of course, not just because he's Cyclops but also because he's a fairly well-articulated and clean figure, with the light-up visor a great representation of his power. Storm had a nice design but was a rather frail figure, with difficulties standing on her own, and Archangel was another well-designed figure whose action feature didn't takeaway from straight playability (he "launched" "knives" from his wings; really just two little missiles that could flicked out of a slot on the top of his wings). In series II, I've always been partial to the Weapon X Wolverine (whose claws were rendered individually, three on each hand, instead of as one piece of gray plastic as with the others) , Magneto (a bulkier update of the smaller Series I figure) and Banshee (that whistle really was a clever and non-intrusive feature). Mr. Sinister, whose eyes and chest diamond lit up a la Cyclops' visor is also a favorite, though that figure suffers for the the fact that his shoulder points push off his plastic cape whenever his arms are raised up. Of the X-Force figures (of whom I had the fewest), Cable, who had a surprisingly streamlined design given some of the busy looks he had in the comics, was always a favorite (I also a had a larger 12 inch version of the figure for numerous years on a bookshelf), along with Stryfe (though he looked better sans mask, which tended to hang off his head at an angle). Being a child of the 80s, my love of comic books was prefaced by a love of several different action figure brands, from He-Man to Voltron, Transformers to GI Joe, MASK to Teenage Mutant Ninja Turtles, and countless others (anyone remember the Ghostbusters action figures? Or Visionaries?). As such, once my love for comics, specifically the X-Men, did develop, it didn't take long to merge that with my penchant for action figures in the form of Toy Biz's line of X-Men figures. I didn't really get into the line until the second series, which was on the shelves, in one assortment or another, right around the same time I got into the comics. The idea of comic book-based action figures wasn't new to me; I somehow mostly missed Marvel's Secret Wars offerings, but had a decent collection of the DC Super Powers figures, as well as the tie-ins to the '89 Batman movie (Bob the Goon!) that Toy Biz did, along with a few of their Marvel Superheroes figures that predated the X-Men line, and I'd probably seen the first wave X-Men figures on the pegs while shopping for new Joes or Transformers or whatnot, but I didn't really know much about the X-Men (beyond "Pryde of the X-Men") before I started collecting the trading cards and buying the comics. As such, the handful of Series I figures I did have, I bought remainder at the same time I was snatching up the Series II (and X-Force) figures. I'm glad I bought them at a discount, because for the most part, the various action features built into the Series I figures are too intrusive, disrupting both the general playability and overall look of the figures. Nightcrawler's suction cup gimmick, for example, is cute, but when you're not sticking him to a window, you're stuck with a figure that has two large suction cups on his appendages. Ditto Colossus, who could lift a large barbell via a lever on his back, but takeaway the barbell, and his arms were permanently molded to be holding it, making it tough for him to, say, punch Juggernaut. Not surprisingly, my favorite figures from that wave are the cleaner ones, with less obvious features, like Cyclops. But Series II dialed back on the features, making them either less obvious or more clever. Banshee's whistle was easily ignored when not in use, Gambit's spring-loaded leg kick was a pretty standard action figure gimmick, and Iceman could easily be enjoyed without sticking the figure in the freezer every time. The X-Force line was, for me at least, harder to find (whether that was a measure of its relative popularity or just coincidence, I have no idea), but I was able to nab Cable and Stryfe, the two figures I cared about the most. For the most part, the plastic representations of my new favorite characters in these series did their job, but as much as I enjoyed them, it would be later series that really caught my interest, as the forthcoming animated series dialed up my interest in the characters, and further inspired the line overall. From the backcover ads of The Real Ghostbusters comicbooks I had a stack, very vividly. Seems around this point where my being a slightly older fan, in high school at the time, started diverging from what was obviously a younger market that was being targeted. Same with the cartoon, which I had some residual interest in as an X-Men fan, but never followed with any loyalty. I was just curious to see how characters and stories I'd been familiar with were translated to cartoon form. "Banshee's whistle was easily ignored when not in use..."
Have to disagree there. The whistle stuck out about an inch from his back and looked ridiculous! I recall getting my mom to cut it off and then file it down to make him resemble a human being. (She also cut off Nightcrawler's suction cups for me). I've generally always, even as a child, hated gimmicks in action figures. All I ever wanted was a plastic representation of the characters I liked; I didn't need them molded in some permanent character-specific action pose and I didn't need them able to punch bad guys -- my imagination could take care of that part. I always liked the SUPER POWERS action features best because they were so unobtrusive. You generally just squeezed the characters' legs or arms to make something happen. I've never understood why Toy Biz didn't take a similar approach, but instead all their figures have random levers and switches sticking out of them. But I do have very fond memories of these figures. I owned all of them, I believe, except Gideon -- even though I didn't know who any of the X-Force characters were! Out of these series, my favorites would have been Cyclops, yellow costume Wolverine, and Nightcrawler. Oh, and I really liked it a few years later when they repainted this Cyclops into the Dave Cockrum costume! That was a cool figure. The laziness of Liefeld's design really shows in plastic form. Ah, I remember getting the core Cockrum/Byrne five (with Magneto, Juggernaut, and Thor) for my 12th birthday, along with VHSs of THE TEN COMMANDMENTS (1956), BEN-HUR (1959), THE UNDERSEA KINGDOM (1939) and a volume of the Charlie Chaplin 1916 Mutual shorts (celebrating their 100th anniversary this year and the next). This was a turning point in Birthdays, for this and that Christmas (where I got Iron Man, Green Goblin, and Flash) was the last time I got any action figures/toys for those gift days. Y'know, I could probably symbolized the rift when I was unable to find the BATMAN RETURNS Batmobile with removable sides for my 13th birthday. After that it was VHS and books for me (there was no intention about it; one year I wanted toys, the next it wasn't a necessary want). The limitations of the gimmicks didn't bother me. I was content to finally have X-Men figures after a dearth of Marvel super-heroes, especially since the Cockrum/Bryne five (with Kitty) was my favorite X-Roster (although I also favor the Oz team and the line-up for the CC-Lee Skrull story). That they made a Storm Action Figure was pretty unique; with exception to GI Joe, Masters of the Universe, and Wonder Woman, are toy franchise (Transformers, Visionaries, Pirates of Dark Water) were hesitant about female action figures. 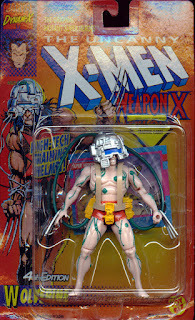 In Summer of 1993, my sister got the Weapon X Wolverine. I used him as Sub-Mariner. The Real Ghostbusters also didn't shy away from female characters in toy form. There are at least 3 Janine action figures in this list. With 2 of them of her as a Ghostbuster and I'm sure this list isn't even complete. The Robin Hood: Prince of Thieves figures found second life as random bystanders (who might die horribly) or even various X-Men in civilian garb (Iceman, Archangel). One of them had a jacket I co-opted for the Jim Lee Cyclops. That one worked way too well and stands as my favorite innovation. Pretty sure a ToyBiz talking Punisher became depowered Colossus. I engaged in some gender-bending as well. That first Sabretooth stood in well enough for Feral, provided I didn't need them in the same "scene." No such problem with using TMNT's Rahzar for Wolfsbane. Yup. Like John F, I was too old for toys when the X-Men figures came out. In college, however, there was a guy in my dorm who collected new Star Wars toys and Batman Animated figures because they looked cool. at the same time, Toy Biz re released a whole bunch of X-Men, Iron Man, FF, and Spider-Man toys on generic cards and KB Toys sold them 3 for $10. Suddenly, I had a random assortment of Marvel favorites, as well as DC figures from the Total Justice & JLA lines. When I could, I also bought Spawn toys and other McFarlane figures and Star Wars characters. My dorm room was littered with them. Luckily, my roommate was cool about it. I didn't have most of the figures here. The only ones I ended up with in any capacity were Cable and Nightcrawler. I got the classic Cyclops repaint as well, which was weirdly smaller than most of my other figures. It's amazing how deep Toy Biz went (Gideon of all characters!) yet how they missed some major characters. Did we ever get a mass-market Kitty Pryde figure? How about Boom Boom? Or Havok? I know they all showed up in various collector-targeted figures but I wish they'd been part of the original X-Men line. I was already 19 in 1991, but I did buy most of the first series. I personally remember almost nothing from these toys, but I was a bit young at the time. I got really into these action figures a bit later, so while I had a few of the series I, I never had an obsessive collection mentality for series 1 and 2 that I'd have in about 2 years when I'm checking every toy store in a ten mile radius by phone to see if they have a Beast figure (they didn't). I think my favorites of these are Weapon X Wolverine, Nightcrawler, and battle-damage Sabretooth. I found Beast and Morph by chance at our local comic shop, and I paid the princely sum of $10.00 each for them, in case they turned out to be short-packed or something (I was only thirteen-ish, but I had already figured out how "one per case" worked). I think it was the right choice; I don't recall ever seeing either of them anywhere else. I do recall calling around on later series, though; in particular the set that included Eric the Red. If Davan Shakari was to be immortalized in plastic, I would have him! No one has mentioned the best part of these figures, the coupon on the back that gave you half off for a mail order subscription back then. I even sent one of these in around 2002 and got the subscription because they never put an expiration date on any of the coupons and they will still honor them. I'm still not sure what the pencil is that Apocalypse comes with? I loved series 3 and picked up each of them and they were very playable. I was really hoping that Barrage would be made, he was in all of the advertising for the wave, Wizard had an image of him and then nothing on release. The extra items these came with were so stupid and just hurt what the figures could do because their body or hands were formed around that. Look at Sabretooth's 'weapon', what is that, when was that ever used? I was 10 when Series 1 came out and 12 when Series 3 released. I was getting older for Action Figures but I still bought these just to put them in teams and have them on a shelf. They didn't receive a ton of play, just shelf enjoyment. They really missed the boat by not making Multiple Man where most shelf collectors would have bought multiples of him. Spawn figures came out around Series 2/3 and were so much cooler than these were. I wasn't even a huge Spawn fan, but they were just much better figures. Oh maaaaaan! I had ALL of these figures, and I mean every single figure and variant released from 1991 through about 1998. While I already had an interest in comics at the time, the launch of this toy line is what put it over the top and was my official introduction to the X-Men specifically. It conveniently seemed to capture my imagination JUST prior to the publication of X-Men #1, so there was no looking back with that kind of corporate synergy at work. The comics, the toys, the cartoon, the trading cards; they all amounted to this perfect storm that ensured I would be a fan for life. That first assortment is admittedly dodgy, with so-so sculpting and odd character offerings. (Though now that I think about it, they're pretty beholden to "Pryde of the X-Men" and the arcade game - which is what the popular/public perception of the X-Men at the time realistically would have been limited to.) Like you, I definitely preferred the "clean" figures with natural articulation. Any character without at least one hand molded into a fist was always my biggest pet peeve (ESPECIALLY that damn Colossus). Of course, the best of both worlds was form and functionality: figures with a cool, yet unobtrusive action feature. I think they actually did a little better in that department with the original line-up - Cyclops, Wolverine, Archangel, Storm, Magneto, and Apocalypse all "do" something without it getting in the way of their poseability. (Plus it produced the only Wolverine with actual retractable claws and a removable mask. Why ToyBiz encouraged you to wear said mask on your finger as a ring, I do not know.) I can definitely attest to eventually ripping the suction cups off Nightcrawler in the spirit of functionality. But hey, he was otherwise a great figure! Also: I feel like series II and III is where ToyBiz really arrived. While they were still hampered by some dumb action features, the sculpting had already improved remarkably. In retrospect, I'm really pleased with the choice of characters too. You knew Gambit would inevitably get a figure sooner or later, but Banshee and Forge? Maskless Wolverine (maybe once they got desperate)? It was a nice little spotlight for that post-X-Tinction Agenda/pre-X-Men #1 team (not to mention pre-X-Men: TAS) that realistically never could've been slotted in at any other time. 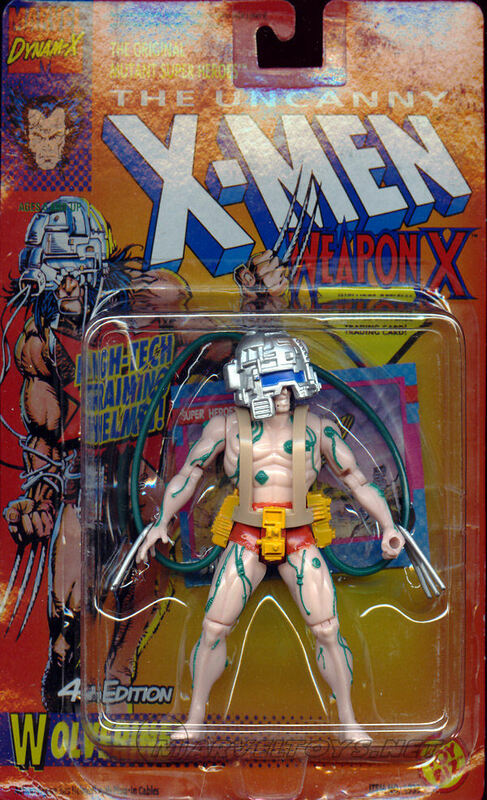 It seems like Weapon X was marketed as somewhat of a "secret character" at first. Notice the card back showing him without claws and his head is obscured by the bulky helmet. I swear initial assortments identified him simply as "Weapon X" without any reference to Wolverine. Like you, I wasn't familiar with this aspect of Logan's history and had NO idea this was yet another Wolverine figure until I actually saw him on the stands. Weird that it's also the only Wolverine with the individually rendered claws. The other two, and subsequent iterations, would have that goofy spring-loaded curved "block" of claws that you couldn't actually retract (just push forward a bit). Wasn't the original, clear, color-changing Iceman found to be toxic or something, hence getting replaced with the more common translucent blue (non color-changing) variant (which played up the ice slide feature instead)? I always felt superior as a smug little kid for having the "rare" original Iceman. There were some other interesting/arbitrary variants to these guys, like Weapon X having the green circuitry recolored as red and Mr. Sinister getting a goatee(?!) All told, I don't remember any of these figures being especially difficult to find, which was a good thing as a young collector. It wasn't until a few years later that you'd have the experience of running all over the place trying to find that one goddamn Rogue in a sea of Wolverines. Finally: see that faint vertical line between Sabretooth and Weapon X? Legend has it that's where Havok was meant to appear, before the figure was shelved. (True of not, this was a telltale indicator of a cancelled figure; it would recur in the next series, where you can still see a tiny portion of the gun for a planned Maverick between two other characters. Of course, that one would eventually be produced.) ToyFare DOES offer an exclusive Havok in his black costume many years later, but it was a repaint of a then-recent Daredevil figure from ToyBiz's (similarly awesome) Spider-Man line with an original head sculpt. So, it could not have been the unreleased prototype from 1992, which I don't think has ever surfaced. I was 21 or so when these came out. Since I didn’t play with figures any more — and this era of X-Men didn’t really speak to me in terms of collecting for display, although I would’ve died for some Mego figures of the Cockrum-to-Byrne versions way back when — I didn’t have any until a couple of random ones, now passed down to my nephew, made their way to me as gifts from a well-meaning relative thinking they were collectible finds. I gotta say that Weapon X edition of Wolverine is pretty great, though, just in terms of surprising fealty to the story. Wow, the amazing nostalgia...thanks so much for doing this series! It's so cool to read about so many people who had experiences similar to mine but with slight variations. The arrival of these figures coincided with my burst of interest in the comics just ahead of the premier of TAS, and I think I had every figure in the first line and most in the next. I got one chunk of them for Christmas one year, and can still remember finding an Arcangel some months later at the mall. Oh, man, some of the accessories...I'd forgotten all about whatever the heck Sabretooth had, but definitely still have puzzled feelings about Gideon's briefcase. And I always joked that Apocalypse's...missile...thing...?...was mutant lipstick for applying his unique makeup choices. With all the talk of action features, I'm surprised no one mentioned Sabretooth's healing battle-damage! That blew my mind as a kid, and still strikes me as pretty solid for an early toy. The toys that never made it into reality still haunt me. I'd look at that Havok icon in the corner "head box" with no real clue as to who he was, totally mesmerized by his head-frills, haha. The lack of an image on the back confused me no end, but I remained convinced I'd find a super-rare Havok on the shelf one day. Alas. I'd REALLY love to see any concept art or even prototype they may have had for him.